Why did you choose to open in this area? The Hilton Head Island, S.C. area is home to a lot of retirees who would like to spend time on the golf course or at the beach; we offer services that will allow them to do that. When I was growing up in New York City, the teenagers and young adults would take care of the neighbors’ yards or help them clean out their garage; College H.U.N.K.S. is like the neighbor kids—we will take care of your junk and moving needs. Everybody! If you need to get rid of some unwanted items, or if you just need an extra pair of hands to move furniture around, the HUNKS are ready to help. You might be relocating to a smaller or bigger house. College H.U.N.K.S.’ full-service professional moving service is here to help. What inspired you to open this business? I was inspired by what this company stands for. Both my wife and I are retired from the U.S. Air Force, and we are big on developing leaders. College H.U.N.K.S.’ core values are: Building Leaders, Always Branding, Creating a Fun, Enthusiastic Team Environment and to Listen, Fulfill and Delight. Our goals are to instill what we have learned from our combined 40 + years of service and to inspire young men and women in the Beaufort and Jasper County area. Fab’rik offers fashion forward, on-trend, affordable clothing and accessories for women of all ages. We also offer personal styling and private shopping parties. I have vacationed on Hilton Head Island every summer since I was a little girl. 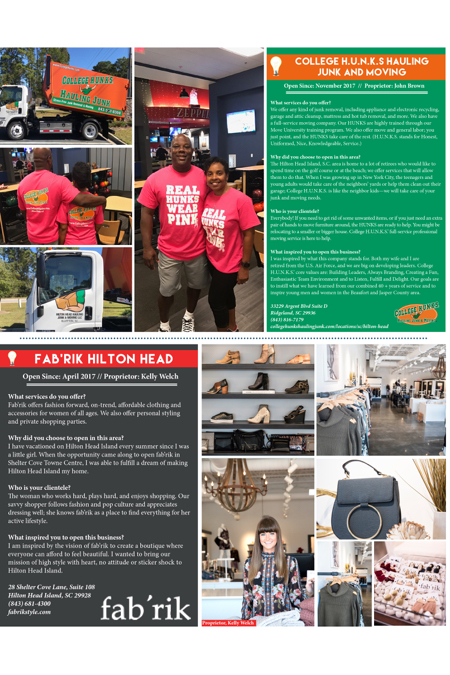 When the opportunity came along to open fab’rik in Shelter Cove Towne Centre, I was able to fulfill a dream of making Hilton Head Island my home. The woman who works hard, plays hard, and enjoys shopping. Our savvy shopper follows fashion and pop culture and appreciates dressing well; she knows fab’rik as a place to find everything for her active lifestyle. I am inspired by the vision of fab’rik to create a boutique where everyone can afford to feel beautiful. I wanted to bring our mission of high style with heart, no attitude or sticker shock to Hilton Head Island. Decorating Den Interiors offer a variety of services to include interior decorating, kitchen and bath design, wall and floor covering, custom closets, window treatments to include both soft and hard treatments, furnishings, lighting, artwork, accessories and more. The Hilton Head Island/Bluffton area is home to me. I am a graduate of Hilton Head Island High School and chose to return to this area after serving 20 years in the United States Air Force; there’s no place I’d rather be. My clientele is varied. I work with new homeowners, current homeowners, builders, apartment dwellers, business owners and commercial spaces. If you have a vision, I help bring it to fruition. I enjoy decorating spaces! 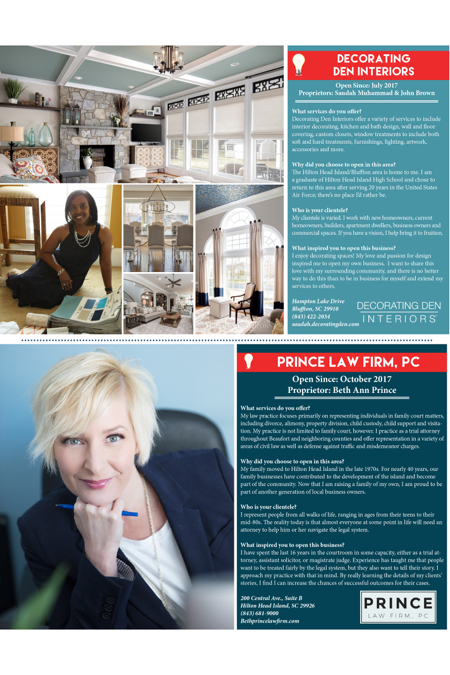 My love and passion for design inspired me to open my own business. I want to share this love with my surrounding community, and there is no better way to do this than to be in business for myself and extend my services to others. My law practice focuses primarily on representing individuals in family court matters, including divorce, alimony, property division, child custody, child support and visitation. My practice is not limited to family court, however. I practice as a trial attorney throughout Beaufort and neighboring counties and offer representation in a variety of areas of civil law as well as defense against traffic and misdemeanor charges. My family moved to Hilton Head Island in the late 1970s. For nearly 40 years, our family businesses have contributed to the development of the island and become part of the community. Now that I am raising a family of my own, I am proud to be part of another generation of local business owners. I represent people from all walks of life, ranging in ages from their teens to their mid-80s. The reality today is that almost everyone at some point in life will need an attorney to help him or her navigate the legal system. I have spent the last 16 years in the courtroom in some capacity, either as a trial attorney, assistant solicitor, or magistrate judge. Experience has taught me that people want to be treated fairly by the legal system, but they also want to tell their story. I approach my practice with that in mind. By really learning the details of my clients’ stories, I find I can increase the chances of successful outcomes for their cases. 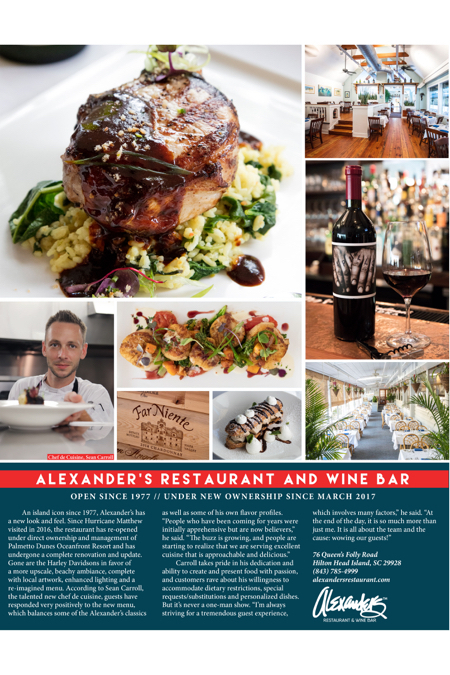 It all started with TJ Anderson, who moved to Bluffton, S.C. in 2008, and became so enamored with the Lowcountry that he decided to stay and serve the community. With Atlantic Performance, he has found an opportunity to provide additional services to our already established customer community built through Atlantic Spray Foam. Atlantic Performance uses the most advanced protective spray available anywhere for truck beds and other uses. The results are high caliber protection in the form of an impenetrable, sealant system that has become the spray-on bed liner industry gold standard. It started with truck spray on bedliner, but Bullet Liner’s high caliber protection can be used almost anywhere and in any color to prevent scratches, scuffs and even mitigate against dings and some dents. Bullet Liner also creates a grip-tight finish that provides footing safety even on wet surfaces like trailer floors and boat decks. Available for truck beds, trailer floors, boat decks, recreational vehicles, tool boxes, and other equipment upgrades. Christmas came early this year! 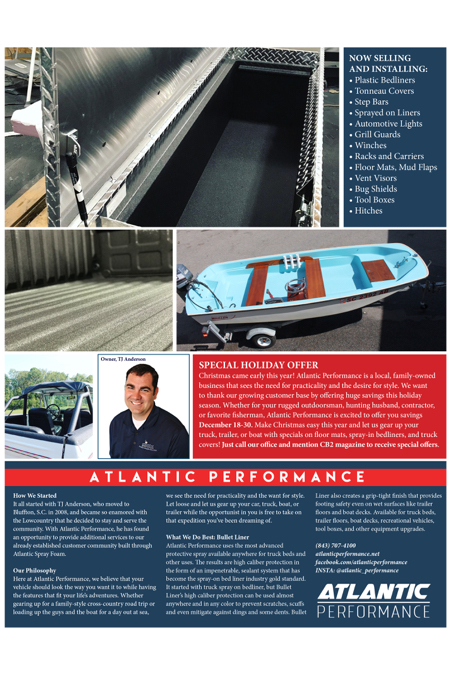 Atlantic Performance is a local, family-owned business that sees the need for practicality and the desire for style. We want to thank our growing customer base by offering huge savings this holiday season. Whether for your rugged outdoorsman, hunting husband, contractor, or favorite fisherman, Atlantic Performance is excited to offer you savings December 18-30. Make Christmas easy this year and let us gear up your truck, trailer, or boat with specials on floor mats, spray-in bedliners, and truck covers! 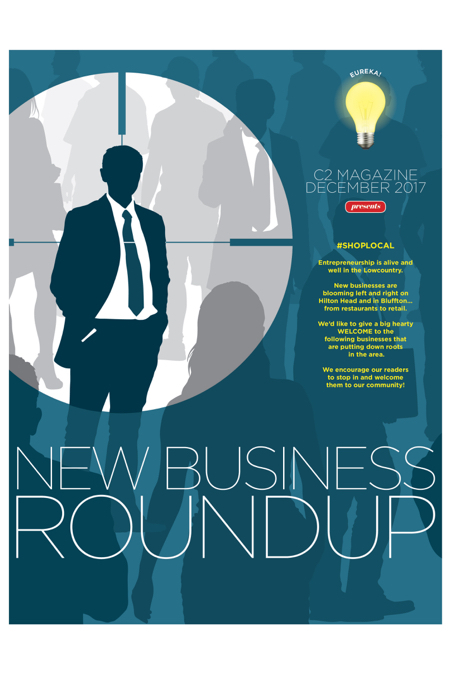 Just call our office and mention CB2 magazine to receive special offers. Providing delicious and beautiful sweets for any occasion—specializing in wedding cakes, specialty cakes, custom cookies, and custom desserts. Hilton Head Island has always had a special place in my heart, and relocating here last year from New Jersey was nothing short of exciting. This area is a wonderful place for weddings and special events, where I can meet a growing need for specialized desserts. 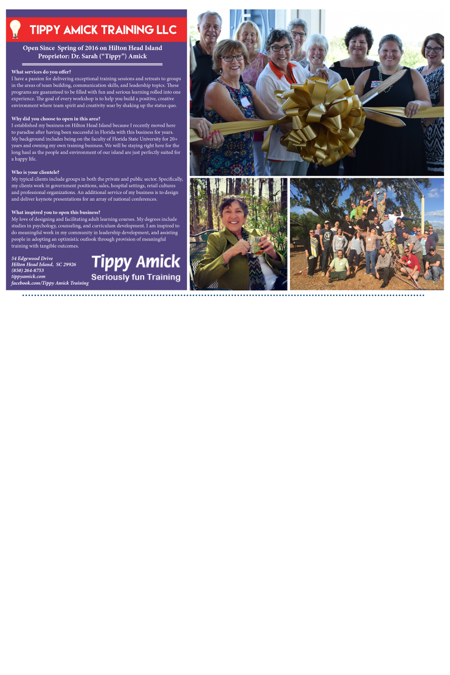 Anyone with a sweet tooth—couples looking to get married in the Lowcountry and locals looking for desserts for all occasions. It has always been my goal to start my own business, and after eight years of experience in the baking and culinary world, I was ready to step out on my own and begin my own venture. It is my family who motivates and inspires me to keep pushing forward, plus the love of cake! We offer kitchen and bath renovations, from simply replacing the countertop to a full remodel. No job is too big or small. My wife and I visited this area for quite some time before deciding in 2014 to make Hilton Head Island our permanent home. Being a general contractor in the Hilton Head Island area provides me with the opportunity to meet and work with people from all walks of life, each with their own unique experiences and tastes. No two jobs are ever the same. Homeowners in the Hilton Head Island/Bluffton area who want to update their kitchens and/or bathrooms. From replacing cabinetry and countertops to completing full remodeling jobs, we will surpass your expectations with competitive pricing, high-quality work, and excellent customer service! 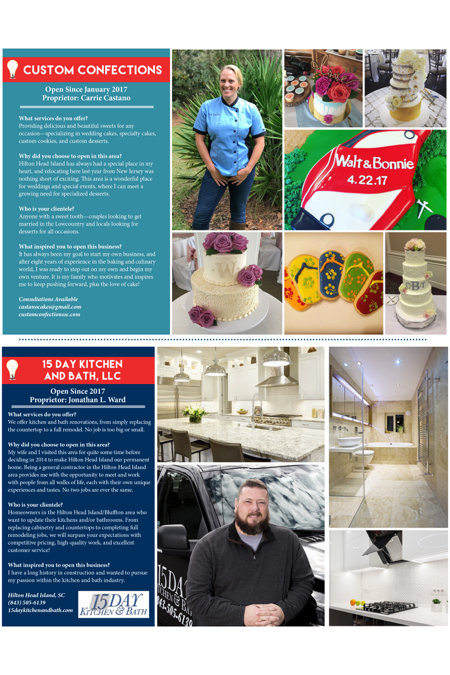 I have a long history in construction and wanted to pursue my passion within the kitchen and bath industry. The attorneys at Olivetti, McCray & Withrow, LLC share a common focus: helping you succeed at every stage of life. This exceptional law firm offers a collaborative, team-oriented approach that is focused on solutions. 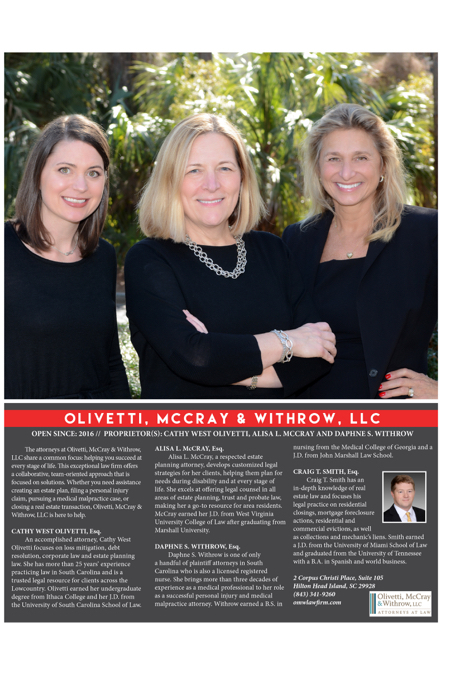 Whether you need assistance creating an estate plan, filing a personal injury claim, pursuing a medical malpractice case, or closing a real estate transaction, Olivetti, McCray & Withrow, LLC is here to help. An accomplished attorney, Cathy West Olivetti focuses on loss mitigation, debt resolution, corporate law and estate planning law. She has more than 25 years’ experience practicing law in South Carolina and is a trusted legal resource for clients across the Lowcountry. Olivetti earned her undergraduate degree from Ithaca College and her J.D. from the University of South Carolina School of Law. Alisa L. McCray, a respected estate planning attorney, develops customized legal strategies for her clients, helping them plan for needs during disability and at every stage of life. She excels at offering legal counsel in all areas of estate planning, trust and probate law, making her a go-to resource for area residents. McCray earned her J.D. from West Virginia University College of Law after graduating from Marshall University. Daphne S. Withrow is one of only a handful of plaintiff attorneys in South Carolina who is also a licensed registered nurse. She brings more than three decades of experience as a medical professional to her role as a successful personal injury and medical malpractice attorney. Withrow earned a B.S. in nursing from the Medical College of Georgia and a J.D. from John Marshall Law School. Craig T. Smith has an in-depth knowledge of real estate law and focuses his legal practice on residential closings, mortgage foreclosure actions, residential and commercial evictions, as well as collections and mechanic’s liens. Smith earned a J.D. from the University of Miami School of Law and graduated from the University of Tennessee with a B.A. in Spanish and world business. I have a passion for delivering exceptional training sessions and retreats to groups in the areas of team building, communication skills, and leadership topics. These programs are guaranteed to be filled with fun and serious learning rolled into one experience. The goal of every workshop is to help you build a positive, creative environment where team spirit and creativity soar by shaking up the status quo. I established my business on Hilton Head Island because I recently moved here to paradise after having been successful in Florida with this business for years. My background includes being on the faculty of Florida State University for 20+ years and owning my own training business. We will be staying right here for the long haul as the people and environment of our island are just perfectly suited for a happy life. My typical clients include groups in both the private and public sector. Specifically, my clients work in government positions, sales, hospital settings, retail cultures and professional organizations. An additional service of my business is to design and deliver keynote presentations for an array of national conferences. My love of designing and facilitating adult learning courses. My degrees include studies in psychology, counseling, and curriculum development. I am inspired to do meaningful work in my community in leadership development, and assisting people in adopting an optimistic outlook through provision of meaningful training with tangible outcomes.